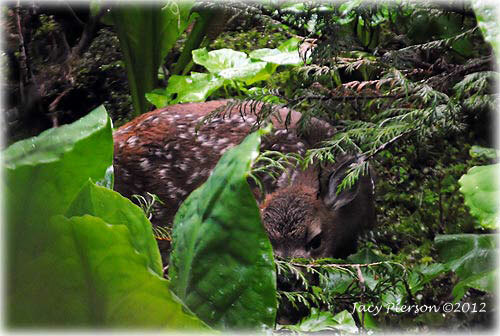 The photographer did not disturb this fawn as it was quietly waiting for its mother's return, the photographer quickly moved along the trail. Be an ethical wildlife photographer and follow the "wildlife viewing ethics" guidelines provided by the Alaska Department of Fish & Game. Ketchikan: Long Lasting Pilot Bread Has a Long History A Feature Article By DAVE KIFFER Pilot Bread, which is also known as hardtack or seabiscuit, may be one of the staples of village life in Alaska, but its history – or the history of a hard baked, long lasting biscuit made mostly of flour and water – goes back thousands of years. Ketchikan's First Annual International Pilot Bread Festival: Trivia contestants and Ketchikan Gateway Borough's Mayor and trivia buff Dave Kiffer . Merle Hawkins (center) was the winner of Ketchikan's Pilot Bread Trivia Contest. The prize was donated by Madison Hardware. The first written reference to a type of hardtack is from during the reign of Ramesses II during the Egyptian campaigns against what where known as the Sea Peoples. During this period, some 1300 years before the time of Christ, sailors in the Egyptian navy carried with them a flat, hard loaf of millet bread called dhourra cake. Since the Chinese had been using millet to make a similar cake for at least a thousand years prior to this, it is entirely possible that early Chinese navies or armies had also been eating a form of millet cake, but there is no historical record of it. A millennium after the Egyptians, the Romans were known to carry a biscuit called “buccellum” on their marches to expand their empire. The next time that “hardtack” shows up in the historical record is during the Crusades, when famed English King Richard I, or Richard the Lionhearted, was reported by contemporary accounts to favor "biskit of muslin," which was a mixed grain compound of barley, rye and bean flour, and took it with him on the Third Crusades (1189-1192) according to the Official History of the British Navy. Some form of the apparently indestructible, long lasting biscuits continued to be used, primarily for military campaigns over the next several centuries. The name hardtack itself comes from the British Navy which began outfitting its ships with rations of hardtack in the 1500s. Tack was the sailor term for food. By 1588, the ration was one pound of hardtack a day for each sailor, who often dipped it hot liquid before eating, both to soften it and to drive out any bugs. Ketchikan: SCIENTISTS KICK-OFF FIRST NOAA-LED SURVEY OF SOUTHEAST ALASKA BEACHES FOR TSUNAMI DEBRIS By Mary Kauffman, SitNews - A team of five NOAA scientists will kick off the first NOAA-led survey of Southeast Alaska beaches for Japan tsunami debris. The team will be leaving from Ketchikan Friday aboard the charter vessel Sumdum. Over the 10-day cruise, the team will survey specific beaches of Southeast Alaska from Dixon Entrance to Cape Spencer, covering approximately 78 kilometers of shoreline across 889 kilometers of outside coast. Rice said other locations further north and west in Alaska will be surveyed later this summer to include a wide swath of Alaska coastline all the way out to Adak. All human-related marine debris will be enumerated and cataloged so scientists can assess their spatial and temporal distribution. Tsunami debris surveys will be conducted periodically throughout the next couple years. On May 17, 2012, U.S. Sen. Mark Begich (D-AK) chaired a subcommittee hearing that included testimony from the U.S. Coast Guard and the National Oceanic and Atmospheric Administration (NOAA). The goal of of the hearing was to get answers to federal government plans for responding to tsunami debris fouling the shorelines of Alaska and the West Coast. The hearing included testimony from David M. Kennedy, Assistant Administrator, NOAA’s National Ocean Service; and Rear Admiral Cari Thomas, Director of Response Policy for the U.S. Coast Guard. “There’s three billion pounds of mostly plastic trash which will flood into our inter-tidal ecosystems and the leading edge of this tide is already here,” Begich said in his opening statement at the May 17th hearing. Fish Factor: High tech buoys soon to measure ocean acidity levels By LAINE WELCH - Thanks to a nearly $3 million show of support from the state, high tech buoys will soon be measuring ocean acidity levels year ‘round, and Alaska fishermen will play an important role in the research.